The First Annual Village Voice Choice Eats gathered an amazing crowd along the Tuesday, April 24th. 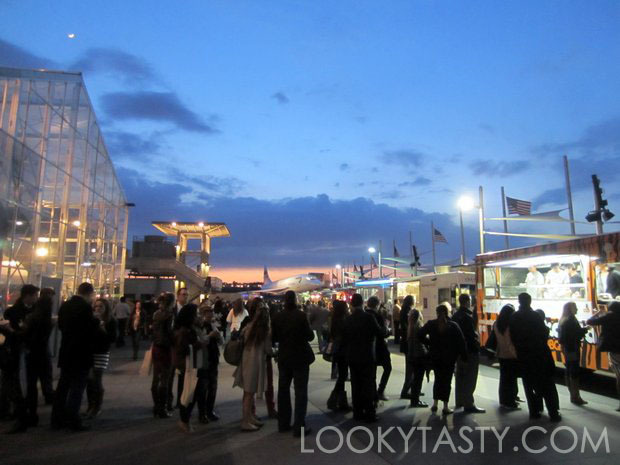 LookyTasty had the opportunity to ask Village Voice’s Event Director Rosemary Jorda a few questions about the preparation for this much anticipated tasting event. Enjoy! What does the role of event director entail? As the event director, my job is to make sure the event happens & happens right! From planning out the location and set up, to looking after all the food choices & trucks to making sure our attendees are happy, my job is to plan, produce and oversee the event. What are biggest challenges in putting together an event like Choice Streets? There are different challenges for every event we take on. Choice Streets’ biggest challenge was the weather since it was outdoors on Pier 86 of the Intrepid. Coming up with a Rain Date and back up plans help make challenges like this easier! What’s the difference, if any, between organizing Choice Streets compared to other events like Choice Eats? The events are quite similar to each other! Choice Eats hosts 50 restaurants from all five boroughs and sets them up for one night of sampling to our guests. Choice Streets challenges us to scour the Food Truck NYC landscape and find 20 of the most sought after trucks, with a variety of food and cuisines for all. With the help of our amazing food edit team here at the Village Voice, we are able to offer our attendees great varieties, hidden gems and fun events both at Streets and Eats. The event will take place on Pier 86 at the Intrepid Sea, Air and Space Museum Complex. How was the location chosen? When looking into a location to place Food Trucks which isn’t an easy task when you are hoping to have over 20 participants. We wanted to find a location with an amazing landscape. After some research, we went on board the Intrepid and were in love with the look and feel of how amazing this landscape could enhance Choice Streets. How are the participating food trucks selected? We work with our food edit team and our Ford in the Road blog to help select our lineup. Are there any food trucks in particular that you’re most excited about? and why? We are excited for all of them! Its such a wide variety – from Coolhaus and their Ice Cream Sandwich’s to Solber Pupusas famous Pupusa’s to New York’s famous boys at Korilla BBQ – there are so many different types of cuisines to be excited about! It seems like there’s always new food trucks popping up. What would be the next kind of food truck you’d like to see in NYC and what will they serve? A Pancake truck in the morning would make my day!